A successful executive in the Northeast was building his dream house and wanted security gates with hidden driveway gate openers. The property was on the waterfront so everything had to be created in aircraft grade and marine grade aluminum. From the start, the request was for the gate to be magnificent, so that it does not detract from the design synergy of the house and landscape. Fleur-de-lis finials on top of 1” solid aluminum pickets were desired. Along with hand forged ovals to accentuate the center row of finials and the bottom of gate required custom pierced and forged scrolls. These pierced scrolls were a real challenge and required a lot of research and design to create. The initial approach was to do it the centuries old approach of drifting the hole, just like black smiths did with wrought iron railings. However, the contemporary alloy of aircraft grade aluminum performed completely different. A completely different approach had to be taken of utilizing the power hammer and with multiple steps move the material to the side to go around the picket area and then punch the thin sliver of material left over. The client also wanted custom designed hinge posts with our Million Dollar hinge for hassle free gate operation. The height at top of arch was 12 ft and low side of gate was at 10’6”, so when the gate was completed, it made for a very, very impressive security gate. 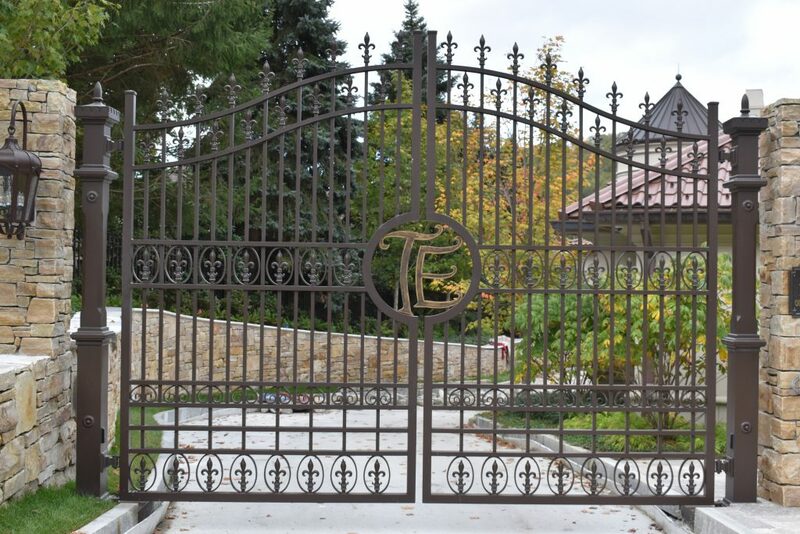 And with the initials in the center, the client has his own personal touch to these phenomenal driveway gates. We also collaborated on the automation and security aspect, proactively having dialogue with the security company, electrician and landscaper so that all conduits and wires were in place for a seamless install and integration into the smart home system. Next time we visit, I want a ride in Susie’s sleigh. It is beautiful. North Carolina doesn’t need sleighs so I look forward to a ride in Susie’s.